As my sister and I laughed at the exuberance and delight of little Sebastian, I couldn't help imagining God's reaction to this elaborate celebration. How these high fives must have delighted His heart and brought our Creator an enormous amount of pleasure. After all, it is HE who created us. It is HE who deserves all the praise. It is HE who we celebrate when we celebrate us! Did you say "no" to that extra piece of cake? 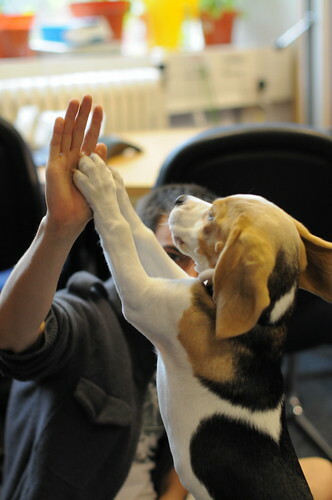 HIGH FIVE time! Did you choose patience over anger, or love over hatred. Then raise your hand and celebrate with God. What could bring our Creator more pleasure than celebrating His workmanship? hmmm. this. . . i need to contemplate. i'm thinking it's all too easy to spend way too much time tearing ourselves down, instead. great thoughts to start the day with. What a cute little man! I love how our children remind us of the heart of God.